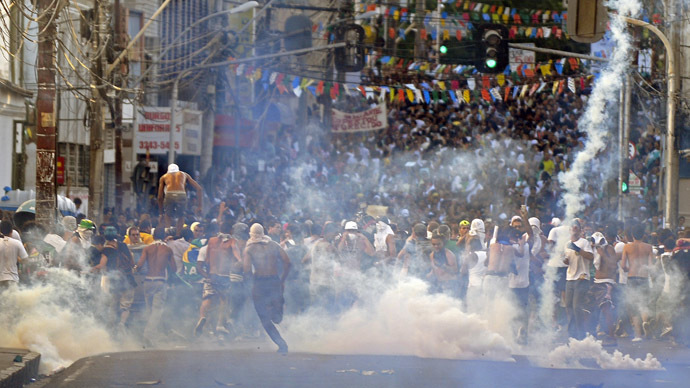 An 18-year-old protester has been killed and dozens injured as massive protests continue in Brazil’s cities. Over a million people have flooded the streets of the country on Thursday. 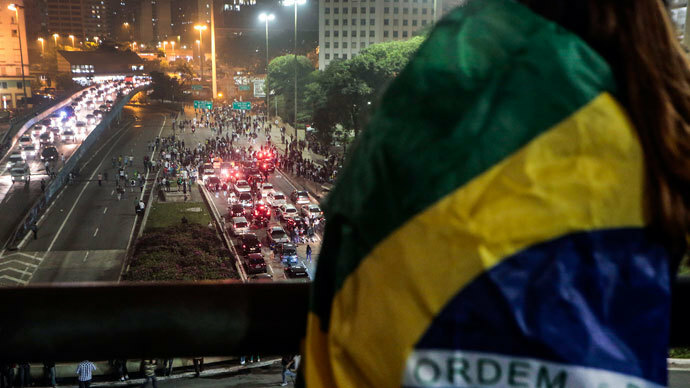 Mass protests continued throughout Brazil Thursday as hundreds of thousands assembled in the main cities of Sao Paulo, Brasilia and Rio de Janeiro with no sign of subsiding even as governments reversed course on planned public transit fare hikes. An 18-year-old protester was killed and dozens injured as massive protests continued across South America’s largest country, with over a million people taking to the streets there on the day. In addition to the one demonstrator killed, three more were injured in the same incident after they were hit by a car in the town of Ribeirao Preto, Sao Paulo state. Witnesses say the car tried to break a human chain created by protesters. Apparently outraged because he was being blocked, the driver accelerated the vehicle and ran over the four. Three people were taken to hospital with fractures, one of them in serious condition. Delefrate Marcos, 18, died at the scene. 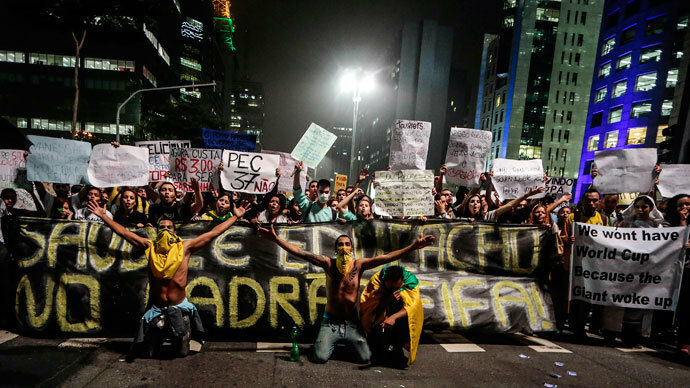 Following the protests, Brazilian President Dilma Rousseff called for an emergency Cabinet meeting Friday morning. She was also forced to cancel a trip to Japan planned for next week. 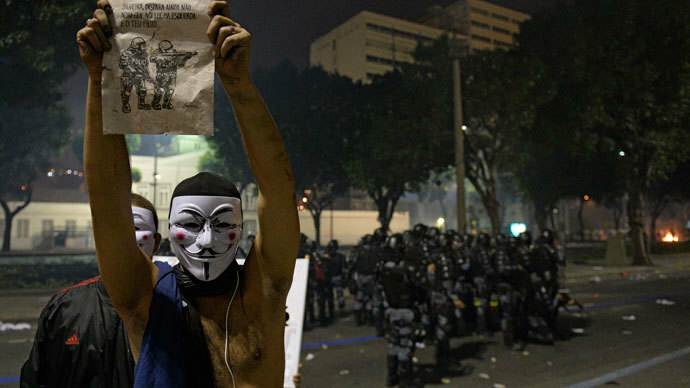 In Brazil’s largest city, Sao Paulo, crowds were estimated to be at 75,000 during Thursday’s demonstrations. 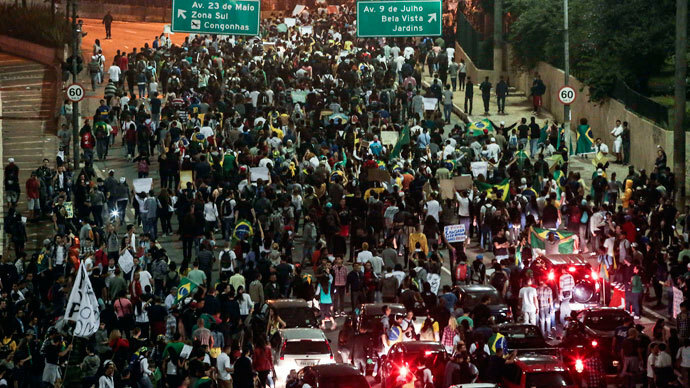 Throngs converged on the city’s main throughway, Avenida Paulista, paralyzing traffic. In Rio de Janeiro, authorities had expected as many as a million protesters despite recent announcements by the state government that it would scrap plans to increase public transportation costs. 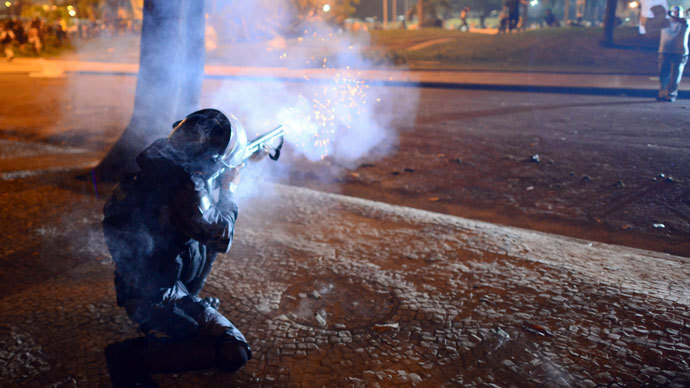 Fifty-five injured people were admitted to the city’s Souza Aguiar hospital following clashes, hospital officials say. 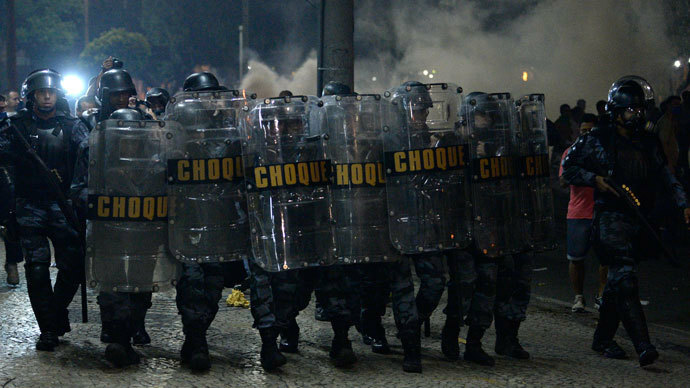 Security forces in Rio resorted to tear gas early on Thursday evening to disperse a crowd making its way to city hall. Plumes of smoke could be seen on video broadcast by local TV. 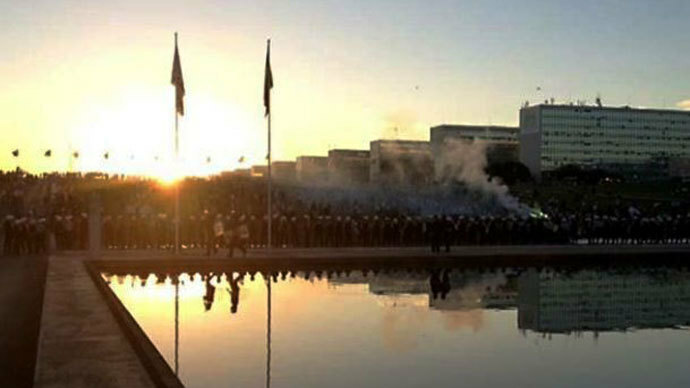 Police in Brasilia, the nation’s capital, were forced to push back as demonstrators attempted to break into the Foreign Ministry headquarters, throwing burning objects into shattered windows, while the more daring darted past security forces and into the building. Elsewhere in the capital, firefighters responded to several small fires, though the large crowds for the most part seemed to only be interested in occupying space. Regardless, there were reports of damage to windows at the Foreign Ministry, graffiti at the Ministries of Health and Culture, as well as one burned-out bus and bus stops destroyed along the main drag. After some seven hours of demonstrations by a reported crowd of 30,000 three protesters were left injured and in critical condition, with about 40 others wounded. Elsewhere in the country, there seemed to be few cities or towns unaffected by the public demonstrations. Thousands were reported to march in Salvador, the capital of Bahia state, and Recife as well as Manaus in the interior of the country, where authorities estimated 85,000 demonstrators converged. In the northern city of Fortaleza, riot police fought back throngs of protesters, though a police cordon was eventually overrun and the state’s main government building, the Palace of Abolition, was eventually broken into. Some 61 people were arrested there out of a crowd estimated to be in the thousands. 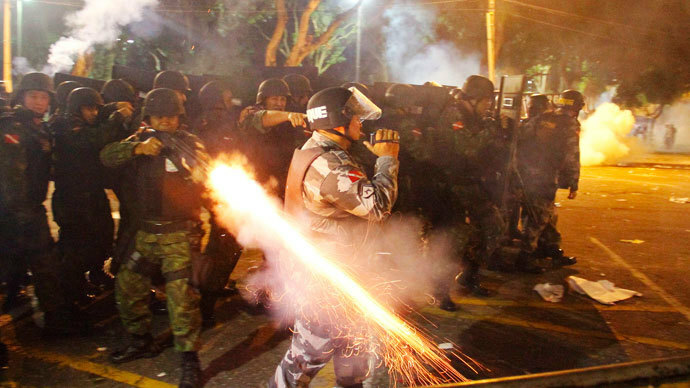 Police also fired large rounds of tear gas against protesters in the city of Campinas in Sao Paulo state in a confrontation adjacent to government buildings. 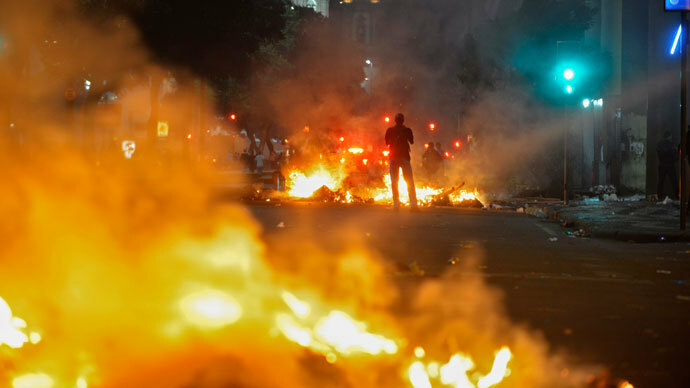 In the southern city of Porto Alegre, military police used a helicopter and tear gas to disperse protesters that were targeting the headquarters of RBS Group, a media conglomerate that publishes numerous newspapers along with radio and television stations. 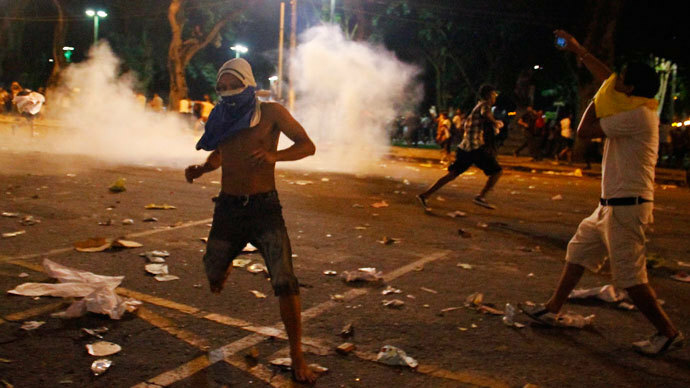 Protesters in Salvador attempted to reach the official residence of Governor Jaques Wagner, but were met with tear gas by riot police, and the crowd was dispersed. 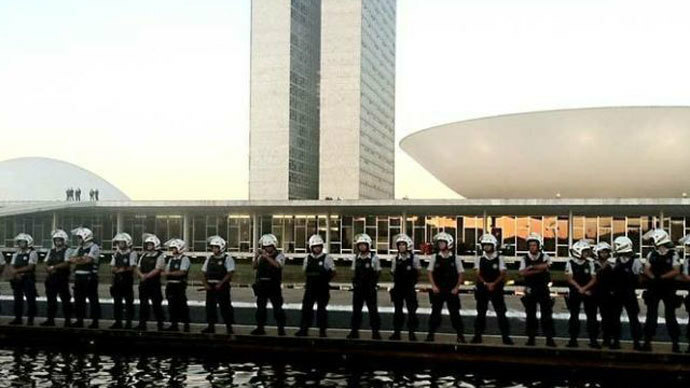 Meanwhile, in Curitiba, a southern metropolis of over one and a half million, city hall was vandalized as Thursday’s protest subsided. The planned transportation fare hikes, which had been the initial catalyst of the protests that have now rocked Brazil since Monday, seem to have become a sidenote as protesters now carry placards demanding the government address chronic corruption and underfunded social services. On Thursday, President Dilma Rousseff’s office announced that she would cancel a trip to Japan on June 26-28 in response to the unrest. “She has ultimately decided to postpone this trip, which would have involved several days of travel. She has decided to stay in Brazil due to current events,” a source told the AFP. Both the federal and municipal governments of the country seemed to be struggling to respond to the nationwide protests, which are both unusual for the country and not affiliated to any political party. Anger about the hike in public transport fares has spiralled into a wider movement demanding an end to government corruption — one fueled by resentment over the $15 billion cost of staging the Confederations Cup and next year’s World Cup. Among the demands made by the demonstrations are higher funding for education and health services, as well as cuts to public officials’ salaries. On Wednesday, some 30,000 demonstrators had clashed with riot police in Fortaleza hours before Brazil was set to face off against Mexico in a Confederations Cup match. Meanwhile, an online video asking for international visitors to boycott Brazil’s World Cup went viral, and even Brazilian football legend Pele managed to find himself amidst controversy after seemingly flippant comments directed at the mass protests. “Let’s forget all this commotion happening in Brazil, all these protests, and let’s remember how the Brazilian squad is our country and our blood,” Pele was quoted as saying by TV network O Globo, which has been the subject of criticism over its coverage of the protest movement. Brazilians were quick to mock Pele’s comments, which mirrored those made a day prior by a FIFA official in response to a near-riot in Fortaleza which sought to distance the sport from the public unrest. A poll of protesters conducted by Folha de São Paulo found that 71 per cent of Brazilians were taking part in a demonstration for the first time, and 77 per cent had finished some sort of higher education, the latter figure reflecting the burgeoning middle class in South America’s biggest economic power and the world’s seventh-largest. 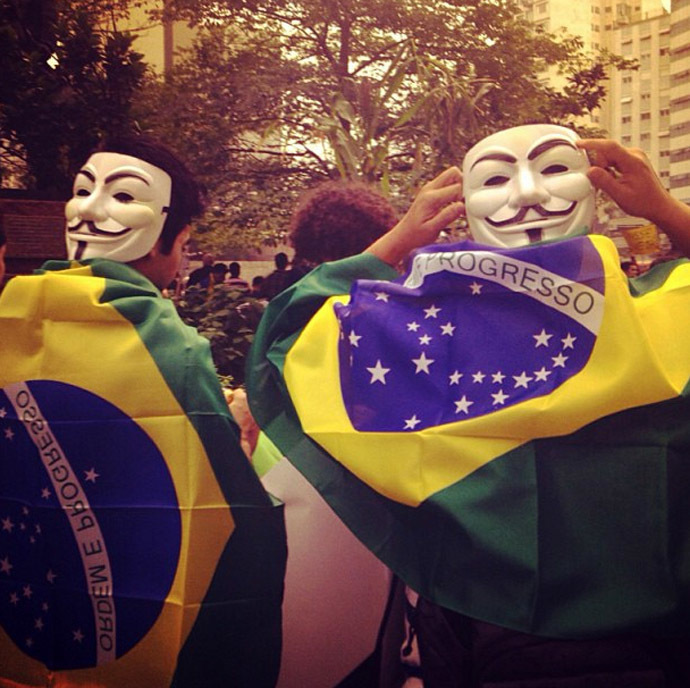 Brazilians have even lashed out at the country’s media, such as Globo TV, which some say is either belittling or playing down the numbers of people showing up on the streets. 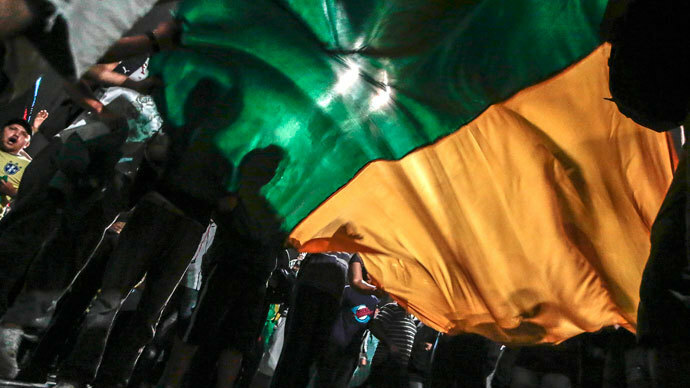 “Globo always manipulates facts and tries to put the demonstrators in a bad light, focusing on the vandalism of a few hooligans,” said Leitane Luranque to the AFP, one of thousands demonstrators at Monday’s rally in Sao Paulo.